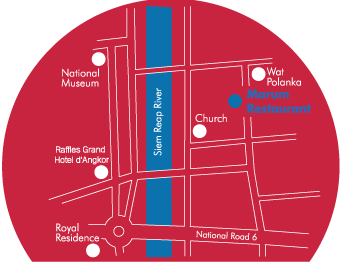 Exploring the Angkor region? Explore creative local cuisine! Take a break from temple touring and enjoy creative local cuisine, delicious cocktails and fruit shakes, made using only the freshest ingredients. All our dishes are designed to be shared so grab a friend and savour a little bit of everything! Take a break in our Friends 'N' Stuff shop! Marum is run by Kaliyan Mith, an NGO that has been working with street children and other marginalized young people since 2005 in Siem Reap, Cambodia.